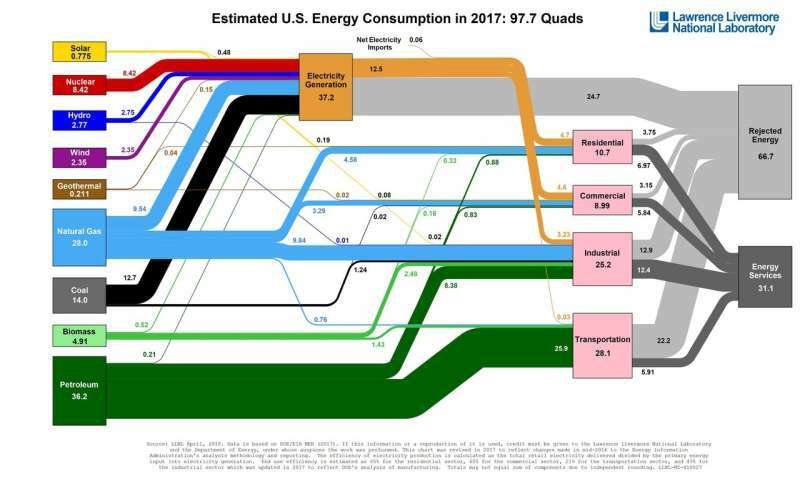 Americans used more solar and wind energy in 2017 compared to the previous year, according to the most recent energy flow charts released by Lawrence Livermore National Laboratory (LLNL). Overall, energy consumption by the residential and commercial sectors dropped a bit. Each year, the Laboratory releases energy flow charts that illustrate the nation's consumption and use of energy. Americans used 0.4 quads (quadrillion BTU) more in 2017 than in 2016. A BTU, or British Thermal Unit, is a unit of measurement for energy; 3,400 BTUs is equivalent to about 1 kilowatt-hour. Solar energy accounted for 32 percent, driven by strong growth in large-scale installations (major solar farms that generate power for electric utilities – from .337 to .483 quads, a 43 percent increase) and strong growth in residential installations (small-scale rooftop systems – from .161 to .192 quads, a 19 percent increase). 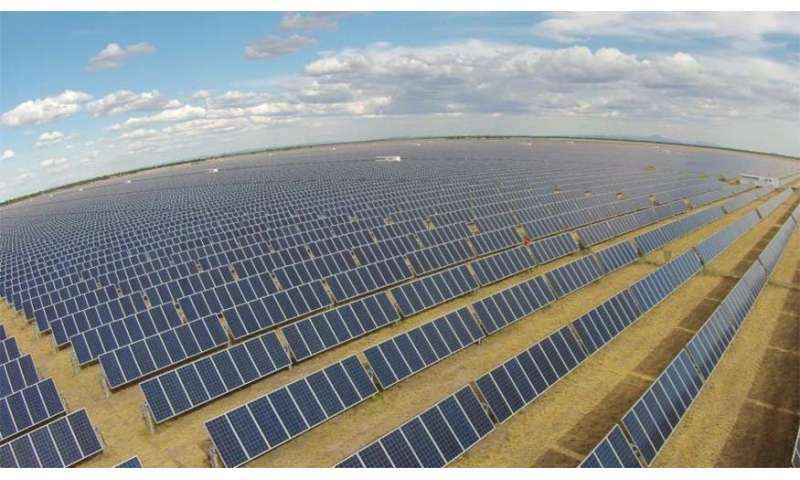 "These rates of growth are due to continued low prices for panels, economies of scale in installations and favorable policies for renewable energy," said A.J. Simon, associate program leader for LLNL's water security and technologies. Wind energy also was up 11 percent, which reflects continued strong growth due to the same factors that have been driving use for a decade: increasingly large and economical turbines and favorable renewable energy policies. Another renewable energy source, hydroelectricity, rose by .29 quads. However, natural gas and coal use for power generation were down. Coal plants continue to be taken offline due to environmental impacts and the high cost of operation relative to cheaper and cleaner natural gas. While natural gas capacity was added in 2017, growing renewable supply and slightly declining electricity demand meant that less natural gas was used to produce electricity. Electricity use in the residential and commercial sectors was down, mostly due to a mild summer across much of the country that required less electricity use for air conditioning. Petroleum use for transportation is up about 1 percent, tracking with the total number of vehicle-miles-traveled, which is reflective of a healthy economy. All energy use results in some losses, shown on the charts as rejected energy. This energy most often takes the form of waste heat, such as the warm exhaust from automobiles and furnaces. The efficiency of the nation's cars, lightbulbs and factories determines how much waste heat is produced, and how much fuel and electricity can be put to productive use.